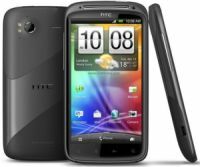 HTC's latest smartphone, HTC Sensation, unveiled last week in London, will hit the Indian shore in the second quarter of 2011. HTC Sensation incorporates a 4.3-inch S-LCD (gorilla glass encased) capacitive touchscreen with a 960 x 540 pixel resolution. It has 768MB of RAM and a 1.2 GHz Qualcomm Snapdragon dual-core processor with an Adreno 220 GPU making it the most powerful HTC smartphone till date. It works on the v.2.3 Android Gingerbread OS and has the latest HTC Sense 3.0 user interface. The internal memory is 1GB which can be extended up to 32GB and the dimensions of the device are 126.1 x 65.4 x 11.3 mm and it weighs at 148 grams. HTC Sensation has an 8.1 mega pixels camera with dual LED flash and touch focus; it can record 1080p HD videos at 30 fps and has a front facing VGA camera for video calling. HTC has introduced a new feature in this device called instant capture. What instant capture does is capture a photo the moment you click the button, unlike older devices where there was a time gap of a few seconds between clicking the camera button and the picture being taken. So you will never miss that priceless moment again. Another handy tool is the video trimmer which helps you reduce the size of the video so it is easier to share on social networking sites. The Taiwan based HTC has also introduced Watch - an application and service that puts an entire library of the latest, premium movies and TV shows right at your fingertips, letting people discover the latest video content in an easy and visually engaging way. HTC Watch uses progressive download technology that makes it possible to watch videos without waiting for a huge file to finish downloading. HTC Watch offers the choice of renting or buying videos, and if purchased, lets you watch them on up to five different HTC devices. Another cool feature in HTC Sensation is its lock screen; you can get info about the weather, stocks updates and social updates directly without unlocking the mobile screen. It also gives you an option of placing widgets like camera, phonebook and messages etc on the lock screen which can then be accessed directly from there. The major difference between HTC Sensation and its predecessors like HTC Desire, Desire Z, Desire HD and HTC HD 7 is in its processor (it's stronger in HTC Sensation) and the fact that the HTC sense 3.0 UI will not work on older versions of HTC Mobile phones. HTC Sensation is definitely the superhero of HTC smartphones.